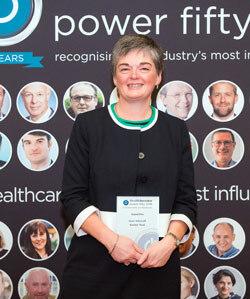 For the second year running, Anchor Trust’s Jane Ashcroft picks up the HealthInvestor Power Fifty Grand Prix. 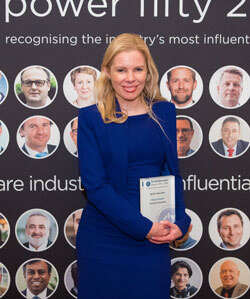 At the helm of an organisation with more ‘Outstanding’ rated services than any other, Jane was recognised by her peers for her “breadth and depth of sector expertise”. The merger of Anchor and Hanover also caught the attention of the market, with one member of the Power Fifty describing Jane as “one of the rare individuals who manages to successfully and very genuinely combine the desire to improve society with a drive to commercial performance”. director. She was appointed chief executive of Anchor on 9 March 2010. Prior to joining Care First she held HR and governance roles with Bromford Housing Group and Midlands Electricity. Jane is a Trustee of The Silverline, a helpline for older people and a non-executive director of Dignity. of the Institute of Chartered Secretaries and a member of the Chartered Institute of Personnel & Development. She was awarded a CBE in the 2013 New Year Honours for services to older people. very pedestrian and conventional approach”. Benjamin joined Octopus in 2010. As chief executive, he is responsible for delivering the company’s mission: to create exceptional healthcare facilities you’d choose for your loved ones. Octopus Healthcare has over £1.5 billion funds under management, delivering investments, developments and partnerships across three core sectors of GP surgeries, care homes and retirement living. Benjamin previously led Octopus’ Intermediate Capital investment team. Prior to Octopus, Benjamin worked at YFM Equity Partners investing across a range of sectors, and worked in corporate finance and venture capital at investment bank Interregnum in the UK and USA. Benjamin has an MBA from the University of Cambridge and a BCom (Hons) degree from the University of Auckland, New Zealand. The HealthInvestor Power Fifty Leading Investor title is awarded to the individual – whether at a private equity firm, family office, REIT or institutional fund – that has spearheaded the most innovative deals or portfolio company exits in 2018. A name that is synonymous with the health and social care marketplace, Deloitte’s David Jones has once again been recognised by his peers as the leading Deal Maker in the sector. Praised for his consistency, longevity and effectiveness, Jones was singled out for “actually getting things done” in a market that has been “all bluster and few completions”. Described by Power Fifty members as “pragmatic and easy to deal with”, David simply “knows everyone and everything and is great at working off market”. For more than 17 years at Deloitte, David has advised on a wide range of M&A across the public and private healthcare sector. He remains at the forefront of the most high-profile and innovative healthcare deals and was recognised as ‘Deal maker of the year’ at the 2017 HealthInvestor Power Fifty Awards and the team was recognised as ‘Corporate financier of the year’ at the 2018 HealthInvestor Awards. Prior to joining Deloitte, David was director of corporate development at Westminster Health Care Group (including Priory Group), one of the UK’s leading independent providers of elderly and specialist healthcare. Well executed deals require a quality transactional lead, and the HealthInvestor Power Fifty Deal Maker accolade goes to the leading corporate financier or property consultant that investors and operators wanted managing their deal in 2018. In one of the most competitive categories, Jeremy Huband stood out from his peers in 2018 for the variety in size and scope of HSBC’s activity in health and social care. Seen as a “highly experienced” banker, Jeremy was lauded for his “consistently strong support of the sector” and one voter said he was “leading HSBC into some amazing deals that will have a massive impact on the sector”. Jeremy leads the HSBC’s healthcare relationship teams across the UK. He has more than 20 years’ experience in the healthcare sector, working with care homes, GPs, dental practices, community pharmacies, private hospitals, day care nurseries, homecare, fostering and veterinary practices. Jeremy is well known in the sector and has a well-developed network of contacts within these markets. He joined HSBC in 2017 from Royal Bank of Scotland and NatWest, where he also headed up healthcare. He aims to raise HSBC’s profile in many healthcare markets and assist quality operators in developing their businesses. Outside the bank, Jeremy has an interest in a learning disability mental health home caring for a dozen adults. He also helps out with the development of some national care home charities. M&A and company expansion just isn’t possible without injections of capital from lenders. This award celebrates the healthcare lead at a bank or alternative capital providers that has been the most supportive to operators and investors in 2018.
problems along the way, he is a huge positive contribution and influence on the sector”. After eight years as chief executive of Four Seasons Health Care, Pete Calveley joined Barchester Healthcare in 2014, bringing to the company his extensive knowledge and understanding of the care sector. He leads a dedicated team of more than 14,000 Barchester staff who provide top quality services for more than 12,000 residents. Pete is also a member of the Department of Health Forward Thinking Group, which informs policy decisions. He has been central to building awareness of the capability of independent operators to provide services that complement the NHS and in making the case for a joined-up approach to health and social care funding. Health and social care providers operate in undeniably tough trading conditions and growing companies in this environment requires a resilient, visionary and pragmatic leader. 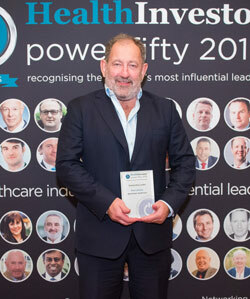 The HealthInvestor Power Fifty Outstanding Leader prize is given in recognition of the chief executive who encapsulates these qualities and more, and has steered their company most successfully through the year. Necessary to every deal or company expansion plan, because of their deep sector knowledge, are the due diligence advisors. 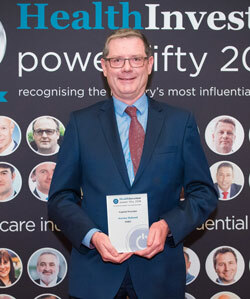 The HealthInvestor Power Fifty Sector Specialist award is presented to the advisor who has shown themselves most indispensable on transactions or as a source of strategic advice in 2018. 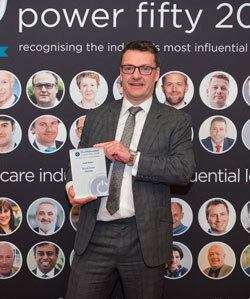 One of the most respected individuals in the health and social care sector, the “wise and experienced” Ted Smith was selected as the leading Non-Executive Director in the 2018 Power Fifty. Praised for his “fantastic guidance and mentoring to executive teams across a range of companies”, Ted “does the right thing in the right way – every time”. Ted qualified as a pharmacist in 1980 and spent the first 25 years of his career in UK retailing, holding senior positions with Boots the Chemist, WH Smith and the Big Food Group. In parallel he also sat on the council of the Royal Pharmaceutical Society and the board of his local Family Health Services Authority. In 2004 Ted moved to the health and social care sector as chief executive of Craegmoor and then to the same role with European Care and then Embrace. Since then he has chaired nine groups within the sector, all in a non-executive capacity. He is currently chair of Accomplish, Keys Care and Pharmacy2U. He also works with G Square, the specialist healthcare private equity house, as operating partner. 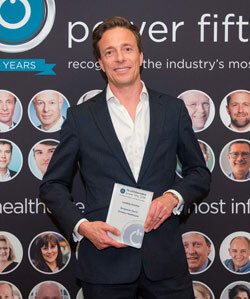 The HealthInvestor Power Fifty NED prize is given to an individual who has shown themselves to be a dynamic, must-have non-executive director or chairman of a health and social care company by being the perfect foil to the executive teams and an invaluable font of knowledge.